This paper reports research into undergraduates' adoption of handheld devices as supplementary learning tools. Students enrolled in Engineering and Business in Australia, Ethiopia and Malaysia volunteered to participate in a study of their use of the HP iPAQ from mid-2005 to late-2006. Researchers observed and analysed the participants' commencing levels of technology adoption, and then there subsequent adoption and perceptions of the usefulness of the iPAQ and its Web 2.0 applications to supplement their formal learning experiences. This research addressed three principal questions. The first was about students' commencing level of technology adoption in each location, and whether some students expressed greater interest than others in trying a new technology. The results show that internet access and ownership of all devices were similar for all groups. Some of the other findings were that female students were less likely to be interested in participating in the project (that is, trialling the new technology) than males; Engineering students were more likely to be interested than Business students; and students whose first language was not English were more likely to be interested than those for whom English was a first language. There was also a very marked difference in the level of interest in the three locations. The second and third questions focused on students' adoptive behaviours. For these students, the iPAQ was not a vehicle recommended for learning because, using Roger's reasons for adoption, it was trialable and observable but it failed to meet expectations. Finally, it had little relative advantage as its functions were already delivered somewhat better by desktops, laptops, and mobile phones. It is notable that it was the Ethiopian students who, despite undeveloped ICT infrastructure, were most open to continue to experiment and persist with the device regardless of trying circumstances. Many technologists believe that advantageous innovations will sell themselves, that the obvious benefits of a new idea will be widely realised by potential adopters, and that the innovation will diffuse rapidly. Seldom is this the case. Most innovations, in fact, diffuse at a disappointingly slow rate (Rogers 1995). The adoption of teaching and learning technologies has been an area of interest in educational literature, with most attention given to the adoption of technological tools by teachers and their institutions (Bates 1997; Bates 2000; Bell, Bush, Nicholson, O'Brien, & Tran 2002; Boezerooij 2006; Collis 2002). Similarly, student adoption of new technologies for personal use has been the subject of many recent studies (Caruso 2004; Caruso & Kvavik 2005; Kennedy, Krause, Judd, Churchward, & Gray 2006; Millea, Green, & Putland 2005; Oblinger & Oblinger 2005; "author" 2005; "author" & "author" 2007). These studies suggest that overall undergraduate students, commonly identified as part of the Net Generation (Oblinger & Oblinger 2005), are rapid adopters of information and communication technology (ICT) devices, partly because they love to be connected and 'always on'. Convenience, connection and control are claimed to be the factors driving the Net Generation's take-up of information and communication technologies (Caruso 2004), and that take-up is increasing steadily (Caruso & Kvavik 2005). Studies from the United States suggest that the young are prolific users of the tools and devices described here (Caruso 2004; Caruso & Kvavik 2005; Oblinger & Oblinger 2005). Recent Australian research appears to concur with the US studies: like their international counterparts, Australian students are enthusiastic about device ownership and use (Kennedy, Krause, Judd, Churchward, & Gray 2006; "author" 2005; "author"& "author" 2007). While student adoption is interesting, a far more important question for higher education institutions is whether these devices and Web 2.0 applications—readily adopted for social purposes—will also be used by students to supplement learning experiences. Defining Web 2.0 is difficult (Phipps 2007) but it is largely understood to include internet applications that enable people to on the web; for example it includes email, msn, discussion forums, blogs and VOIP software.. This paper reports research findings related to this question, specifically undergraduate student adoption of mobile devices for learning purposes in three diverse cultures and contexts (Australia, Ethiopia and Malaysia). It reports on 497 students' initial ownership and use of mobile devices and Web 2.0 applications, their level of interest in being part of this project (and by doing so, eventually own the Hewlett-Packard iPAQ 5550, a device that was new to most of them and more powerful than their mobile phones at the beginning of the research). It also reports on 44 selected participants' adoption (or not) of the iPAQ and their perceptions of its usefulness as a supplementary learning tool. Is it observable? Can it be seen by others? (the more observable the innovation, the greater the rate of adoption). This theoretical context will be used to analyse students' adoption behaviour in this research. What are the commencing level of adoption and use of existing technologies in each location, and do some express greater interest than others in trying a new technology? Did the selected participants readily adopt the iPAQs for personal use and for study-related activities? If so, is there any evidence of the Rogers' five factors affecting adoption? As a result of their use of the iPAQ for at least a year, did they perceive it as a useful learning tool? Were there notable differences in student responses from the three diverse contexts and cultures? In early 2005, nearly five hundred students in Perth, Miri and Addis Ababa, were invited to participate in the project by completing an initial data gathering survey (see Appendix A). Their responses were used for the random selection of 54 participants matching the number of available iPAQs). These students were invited to meet and receive their devices and training in their use: all participants attended and were introduced to the device and its uses, and its wireless and Bluetooth capabilities. Students were issued with a handbook of instructions, and introduced to the student mentors (Perth only) and support staff. Short streaming video clips were available on the web and also downloaded onto each iPAQ. The devices were loaded with standard Office applications, and were Bluetooth and wireless-enabled, but had no capacity for telephony. Participants knew that they would be given an iPAQ (which they could keep after the research), and that they would not be penalised for not using it for their studies. Nevertheless, they were encouraged to use the device for one specific course task: the Engineering students (in Perth and Miri) were required to participate in group blogs with peers as part of their formal study, but the use of the iPAQ was not obligatory. The Business students (in Perth and Addis Ababa) were paired (one student from each location) and encouraged to communicate about their studies in their Business Law unit. Each student's photo was published on a website so their partners could see them—they were then encouraged to email each other at least once and use their iPAQs to continue to communicate using instant messaging, blogs and VOIP. Beyond these encouragement activities, students were told they could use their devices for any purpose. They received email reminders but were not compelled to use their devices, or to communicate with their peers. At the conclusion of the project in June 2006, the 54 participants were invited to complete a final survey (see Appendix B) which reported their use of the tools and their perceptions of their usefulness. The initial data gathering survey was completed by 497 students: 359 in Business (322 in Perth and 37 in Addis Ababa) and 138 in Engineering (96 in Perth and 42 in Malaysia). Of the 54 selected participants, 44 submitted all initial and final data. Table 1 shows the gender, first language and age groups of all students, and of participants, by location. The table shows that there was no difference in the gender composition of students in the three locations. However, students in Malaysia and particularly in Ethiopia were more likely to be studying in at least their second language, and the students in Ethiopia were older than the others. The table also shows that the participants were similar in gender and age to the larger cohort, but that they were more likely to have English as their first language (p<.05). Students were asked to register their level of interest in participating in the project. They were informed that participation was not related to their class assessment and that if selected, they would be able to keep the iPAQ. Females were less likely to be interested than males (p < .05), Engineering students were more likely to be interested than Business students (p < .05), and students whose first language was not English were more likely to be interested than the remainder (p < .05). There was a very marked difference in the level of interest in the three locations, as is evident in Table 2: roughly a third of the Australian students indicated each level (not interested, a bit interested, very interested). Two thirds of the Malaysian students said they were very interested, and all students in Ethiopia expressed some interest (all except one were very interested). The high level of interest in Ethiopia was in contrast to the trends reported above: there were approximately one-third females students in Ethiopia, and all were Business students. To ascertain their commencing level of technology adoption, students were asked to report their access to the Internet off-campus, their ownership of a range of devices including those which at the time were considered relatively new (such as MP3 players and iPods). Table 3 shows that off-campus access to the Internet was higher in Australia (p<.05). Laptop and handheld computer ownership was similar in all locations (p>.05); however Ethiopian students were less likely to own a mobile phone (though ownership was still 81%) or an MP3 player (p<.05). The table also shows that for selected participants, internet access and ownership of all devices were similar. Students were asked to report their use of applications including those which at the time were considered relatively new (e.g. blogs and Voice Over Internet Protocol, VOIP). Table 4 shows students' reported use of emerging communications applications in each location: students in Australia reported higher use of SMS and VOIP (p<.05) and students in Malaysia reported higher use of instant messaging and blogs (p<.05), and VOIP was virtually not used at all at that time by the Malaysian and Ethiopian students. There were no significant differences in the levels of use reported by participants and non-participants. Of the 44 selected participants who completed the project, 21 were in Australia, 11 in Ethiopia and 12 in Malaysia. Those ten students who did not complete the project were all in Australia and they were in both Business and Engineering. In spite of repeated requests to submit their final surveys, these students failed to do so. The Ethiopian students could be described anecdotally as the most enthusiastic cohort of students: they participated gladly, and returned all requests for feedback quite promptly. The Malaysian students were similar. Both groups had a local teaching staff member coordinating their participation, but requests for data came from "offshore" (from Perth). The Australian students also had a local coordinating teacher, as well the option of face-to-face access to the project management team. Nevertheless, this is where the greatest amount of "drop out" of the project occurred. Having had the use of the iPAQ for a year, 44 completing participants reported on their use and perceptions of the iPAQ. Figure 1 shows students' reported use of the applications using the iPAQs—they range from the standard pre-installed applications (such as Word, Excel and PowerPoint) to those that students could install themselves (such as VOIP and RSS readers). The figure shows that most students tried most applications at least once or a few times, though not always, for study-related activities, and a minority reported using some applications often. No students reported using any applications more than "once or a few times" for study-related activities. Applications for study-related activities were mainly Office (Word, Excel and PowerPoint), email and the Internet (the last two were used often and very often for purposes other than study). Other applications used often or very often (but not so much for study) were blogs (6 of eleven students said these were for study as well), VOIP, chat (instant messaging) and video replay. The assumption here is that non-study-related activities can be classified for the most part as socialising activities. Student use of applications was clearly linked to their access to wireless networks. Table 5 shows participants' reported use of the wireless networks on- and off-campus. The table highlights the issue of poor access to on-campus networks—a quarter of the students did not or could not access the campus wireless network. Only 7 students (16.3% of the participants) used the campus network often. Access to networks off-campus was less: over half the participants never accessed an off-campus network, and nine students used an off-campus network often. You have now been using an iPAQ for several months—in your opinion, is it a useful for your university studies? Would you recommend this kind of device to your friends? Why or why not?Again, there are no right of wrong answers—it is important for the research that you say honestly what you think. Forty students answered this question—roughly half said yes (with some caveats) and indicated that the iPAQ was useful. The remainder said no. Among the three diverse locations, the Australian students appeared to be the least forgiving when the technology did not deliver on expectations, and the Ethiopians were the most forgiving. Those participants who reported negative feedback (and even some who were positive) commented on the size of the device (it was too big for some, and too small for others), its battery capacity, its speed, the smallness of its on-screen keyboard, and its limited capacity to connect to wireless (this was due to infrastructure problems). In general, students' comments indicated that the iPAQ compared unfavourably to three other devices they used—the laptop, the desktop and the mobile phone. In general, students indicated that the three devices already in their possession were more than adequate for their needs, and generally had more power (desktops and laptops), were just as mobile (laptops and mobile phones) and just as "clever"—that is, their mobile phones could do basic operations as adequately, if not better. I think that the most useful aspect of the iPAQ is its organisation tools: i.e. : calendar and schedule planner. I personally would not recommend this kind of device to friends, as most mobile phones now feature these same tools, at a fraction of the size, and with the much more useful features such as SMS and normal phone calls. It is not the ideal electronic device in terms of tertiary studies because the screen is too small to view any notes or documents. A good piece of equipment would be a laptop, since it is basically a computer. I think it's not that useful even though we can use it to jot down whatever that's being taught during lecture. I would prefer using pen and paper instead of the iPAQ as it's faster and I already got used to it. I think it's rather annoying to bring the 'big size' iPAQ around, as I already got a mobile phone that is very useful. There are several functions that my mobile phone have (so do the iPAQ but not all) - mp3 player, camera, notepad, Bluetooth, infrared, radio, GPRS, etc. I will not recommend this kind of device to my friends because it's not that useful and it's costly usually. Overall, the iPAQ to me was not that much of an academic aid. I prefer using my laptop. It's compatible with almost everything. The iPAQ is a good instrument for learning activities. I have been using it for doing assignments but as I said before I didn't use it to its full potential but that doesn't mean that it is not useful in those aspects. These days especially me and my friends here are talking about how we can use it efficiently. I recommend this type of device to anybody, because if used effectively it will help them in their day to day activities plus their studies. I can not say that it is very useful for university studies, at least for me, given that we don't have the necessary infrastructure to get the best out of the iPAQ. Rather people looked at it as a luxury thing. I used it to get a quick look at my module notes of my studies. This device is very useful in associating the learning process with today's technology. So it will be good for the other students to have it. Like recent previous studies (Caruso 2004; Caruso & Kvavik 2005; Kennedy, Krause, Judd, Churchward, & Gray 2006; Oblinger & Oblinger 2005), the results of the initial data gathering with nearly 500 students confirm that undergraduates have high off-campus access to the Internet (with higher access reported by those studying in Australia). Laptop ownership was predictably high (approaching 50%) and handheld computer ownership was predictably low in all locations (the approximately 8% ownership reported here is similar to results in other studies (Caruso 2004; Caruso & Kvavik 2005; "author" 2005). This is possibly not due so much to the socio-economic status of the students (which according to their teacher in situ was high in comparison with their compatriots) but possibly to the availability of mobile and ICT devices in general. In Australia and Malaysia, ownership of MP3 players was quite high (around 40%) and mobile phones were almost ubiquitous. Somewhat unsurprisingly, the Ethiopian students were less likely to own a mobile phone or an MP3 player. Clearly, technology adoption is likely to be highly correlative with level of disposable income, and this data was not collected in this research. The students in the larger cohort were keen adopters of emerging communications technologies: over 90% of students in all three locations used SMS, and about half the students in Australia and Malaysia used MMS. Instant messaging was used by at least two thirds of the students in Ethiopia, and by the vast majority of students in the other locations. Students in Malaysia were particularly keen users of blogs (which were yet to be adopted by the Ethiopian students). The contradictory non-use of VOIP by Malaysian students suggests that the service was not available in this particular part of Malaysia (Sarawak). It was used by about one fifth of Australian students. The focus of this research is the adoptive behaviour and evaluation of innovations by the 44 selected participants. 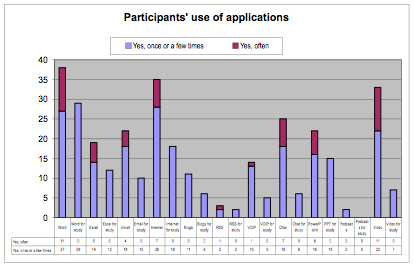 Having had the use of the iPAQ for a year, participants were asked through a final data survey collection to report their use of applications (for study-related and unrelated use). Their limited use of new and emerging applications on the iPAQ for study-related purposes suggests that there is little transference between social activity and study-related activity. There has been some speculation that because students carry "digital backpacks" bulging with their personal convergent and mobile devices, they might use these not only for social interaction (which is of high importance to these "Net generation" students), but that they might transfer their use for study-related activities (Millea, Green, & Putland 2005; "author" 2007). The evidence here suggests otherwise: apart from Office applications, email and internet, students seem to clearly separate these activities. From the results in this study, we may assume that study activities involving frequent access to the internet (as reported by these students) were confined to desktops and laptops. The qualitative findings support this supposition. The effect of the unreliable wireless access to students in this project cannot be underestimated. Students were frustrated that the wireless was unreliable and at times too slow, and in their comments they seemed at times not to separate the device and its intended wireless capability from the actual wireless on campus. This poor access to wireless networks had a negative effect on the project, as evidenced by student comments in the final evaluation. Even though half the participants did not access wireless off-campus (either because there were no networks to access, or they did not try), nine students did use off-campus networks often. Also, the particular model of the iPAQ issued to students was a factor—the device needed a platform reinstall to be able to access the network, and this proved an insurmountable stumbling block for some because of their lack of technology skills. The rapid rate of change and obsolescence of the mobile device is an ongoing challenge in research, particularly when students have high levels of personal ownership of mobile phones which are becoming increasingly "smart". compatibility and consistency—the iPAQ suffered from high expectations—student comments suggest that it was bigger than a phone so should have been able to do more; it was smaller than a laptop, so should have been much more portable. For some, it failed on both counts. ease of use—several students said they found it difficult to use, but the complexity factor here would have to be tainted by unreliability (particularly in terms of wireless access). In many ways because of no fault of its own, the iPAQ was perceived not to deliver what was promised and expected. trialability—the iPAQ was the students' device to keep. In the end, the opportunity to experiment with it, add software and try new applications did not entice many students to evaluate it positively. observability—could it be seen by others? The device was highly visible, and anecdotal evidence suggests that its visibility was quite a novelty for peers. Nevertheless, again this high level of visibility did not translate into a positive evaluation and ultimate adoption for many. To be fair, the iPAQ was probably intended for the business executive rather than for undergraduate students. The initial findings of this research, that around 8% of students already owned a handheld computer, were an indication of the voluntary adoption of this device by undergraduate students. They clearly did not need to be persuaded to own mobile phones, MP3 players and laptops, and they had chosen to own those devices rather than a handheld computer. This research addressed three principal questions. The first was about students' commencing level of technology adoption in each location, and whether some students expressed greater interest than others in trying a new technology. The results show that internet access and ownership of all devices were similar for all groups (although off-campus access to the Internet was higher in Australia and Ethiopian students were less likely to own a mobile phone (though ownership was still very high) or an MP3 player. Students in Australia reported higher use of SMS and VOIP and students in Malaysia reported higher use of instant messaging and blogs, and VOIP was virtually not used at all at that time by the Malaysian and Ethiopian students. Female students were less likely to be interested in participating in the project (that is, trialling the new technology) than males, Engineering students were more likely to be interested than Business students and students whose first language was not English were more likely to be interested than those for whom English was a first language. There was a very marked difference in the level of interest in the three locations: about a third of students in Australia said they were very interested, as did two thirds of the students in Malaysia and all students (except one) in Ethiopia. The second and third questions focused on students' adoptive behaviours: did the selected participants readily adopt the iPAQs for personal use and for study-related activities and if so, was there evidence of Rogers' five factors affecting adoption; and after a year of voluntary use did the students perceive the handheld device as a useful learning tool? Rogers claim that "most innovations . . . diffuse at a disappointingly slow rate" (Rogers 1995) seems to ring true in this research: beliefs that advantageous innovations sell themselves, that the obvious benefits of a new idea will be widely realised by potential adopters, and that the innovation will diffuse rapidly are unfounded. Rogers work shows that for complex mix of many reasons, some innovations do not diffuse with some cohorts. He also claims that to become ubiquitous, an innovation is usually adopted by about 25% of the target group. This study suggests that this is unlikely to be the case with handheld computers and undergraduate students (bearing in mind that the capabilities offered by many handhelds have now been subsumed by mobile phones). It is notable that it was the Ethiopian students who, despite having to work with an undeveloped ICT infrastructure, were most persistent and open to continuing to experiment with the device regardless of trying circumstances. The demise of the handheld in favour or other devices has been predicted for some time; this research shows that if uptake by undergraduates in these three countries is an indicator, then reports of that demise have not been exaggerated. Hewlett-Packard has now ceased production of the iPAQ, presumably because other products such as smart phones, subsume their place in the market. In addition, there is clear convergence of devices—since this research was commenced, there is no longer a clear divide between phones, MP3 players, and handheld computers. Despite the obsolescence of the device tested here, perhaps the most interesting aspect of this research is students' apparent reluctance to use their social applications and devices for learning. This study suggests that undergraduate students are unlikely to adopt handheld devices and voluntarily use Web 2.0 applications to supplement formal learning experiences. The research in this area appears inconclusive, and is likely to be highly dependent on students' circumstances. Sharples (2006) claims that 'Children in general do not want school to intrude on their personal life. There is a danger that the enthusiasm of schools, and some parents to extend school by, for example . . . bite-sized teaching and revision via SMS, and new technologies such as location-based tracking, may be seen by children as schools attempting to colonise and control their social world. There is a need to discuss where the bounds of the school lie and where it is not legitimate for formal education to intrude on childhood'. Similar headlines appeared in relation to the wide-ranging JISC Learner Experience Project: manager Lawrie Phipps is reported to have said that 'Students really do want to keep their lives separate. They don't want to be always available to their lecturers or bombarded with academic information' (Hoare 2007). Even so, Conole et al. reported that in their LEX project that there is evidence of the transfer of practices of their use of technologies in other aspects of their lives to their learning context—for example MSN chat, Amazon, eBay and Skype (Conole, Laat, Dillon, & Darby 2006). Likewise in the United States, the 2007 ECAR report on undergraduate students and information technology found that a majority of students see themselves as innovative adopters of technology, and that most own at least two devices—usually a laptop and mobile phone. US students prefer to be in contact with their institutions using an institutional email account (rather than a private account), and particularly since dramatic events such as the Virginia Tech shootings, like their institutions to contact them by SMS in case of emergency (Salaway, Caruso, & Nelson 2007). Likewise, we also ask students to report on technology ownership and use it as if it were something special. Phipps, manager of the UK LEX project recalls interviewing a first-year female arts undergraduate who professed absolute ignorance of e-learning or web applications. "She was updating her blog at an internet café and then started integrating photos from her Flickr site on to the blog. At the end of it she said, 'That's not technology. That's what I do.' (Hoare 2007). In this project, students were asked to evaluate a device for its learning utility—in essence, the iPAQ was not a vehicle recommended for learning because, using Roger's reasons for adoption, it was trialable and observable but it failed to meet expectations. Finally, it had little relative advantage as its functions were already delivered somewhat better by desktops, laptops, and mobile phones. Bates, A. W. 2000. Managing Technological Change: Strategies for college and university leaders. Jossey-Bass, San Francisco. Boezerooij, P. 2006. E-Learning Strategies of Higher Education Institutions: An exploratory study into the influence of environmental contingencies on strategic choices of higher education institutions with respect to integrating e-learning in their education delivery and support processes. Twente University, Twente, Netherlands. Brown, T. H. 2005. "Towards a Model for M-Learning in Africa". International Journal on E-Learning, vol.4, no.3, pp. 299-315. Collis, B., & van der Wende, M. (Ed.). 2002. Models of Technology and Change In Higher Education: An international comparative survey on the current and future use of ICT in Higher Education. Twente, CHEPS, Centre for Higher Education Policy Studies. Oblinger, D. G., & Oblinger, J. L. (eds.) 2005. Educating the net generation: EDUCAUSE. Oliver, B. (2007). What is quality university learning and how might micro-learning help to achieve it? In T. Hug (Ed. ), Didactics of Microlearning (pp. 365-378): Waxman. Oliver, B., & Goerke, V. (2007). Australian undergraduates' use and ownership of emerging technologies: Implications and opportunities for creating engaging learning experiences for the Net Generation. Australian Journal of Educational Technology, 23(2). Rogers, E. 1995. Diffusion of innovations (4th ed.). New York, Free Press. Sharples, M. (ed.) 2006. How can we address the conflicts between personal informal learning and traditional classroom education? You are invited to participate in this research by completing the questions which follow. Your responses will not be used to identify you unless you are interested in participating in the project (in which case you will be contacted by email). Are you interested in participating in this programme? Tick one. Your answers to questions in this section will not affect your potential involvement in this programme. Do you have access to the internet outside University? Do you have a laptop computer (also known as a notebook)? Do you have a handheld computer (also known as a PDA, Palm Pilot etc)? Which (if any) of the following communication tools do you use? Several of these are recent developments; you may not have heard of them. 1. Do you use SMS? 2. Do you use MMS? 3. Do you use instant message software such as MSN messenger? 4. Do you use a blog? 5. Do you use mobile blogging? 6. Do you use VOIP such as Skype? 7. Do you send or receive podcasts? 8. Do you use something not listed here? Please explain. This semester we have deliberately left you to use your iPAQ as you wish, to see how you went without too much direction from the project. Now we need to conclude the project, and formulate the research findings, based on your feedback. Please assist us in the research by answering all the questions honestly and as well as you can. Please simply reply to the email and follow the instructions (deleting or typing as requested within the table which follows) before June 1, 2006. Your answers will not be used to identify you in anyway. Remember, WHEN YOU HAVE SUBMITTED THIS SURVEY, the iPAQ belongs to you! Which campus are you currently studying at? Do you do word processing on your iPAQ? Yes, once or a few times. If you answered yes to the question above, is that use ever related to your studies? Do you create or update spreadsheets on your iPAQ? If yes, is that use ever related to your studies? Do you send or receive email on your iPAQ? Do you browse the Internet on your iPAQ? If you answered yes in the question above, is that use ever related to your studies? Do you read or post to blogs on your iPAQ? Do you receive RSS feeds on your iPAQ? Do you use a VOIP application such as Skype on your iPAQ? Do you use an instant messenger application such as MSN Messenger or Yahoo Messenger on your iPAQ? Do you view slideshows on your iPAQ? Do you send or receive podcasts on your iPAQ? Do you view video clips on your iPAQ? Do you use a wireless network OFF campus (at home, in public places) to connect to the internet with your iPAQ? In this project, you were offered the opportunity to interact with students in your own and other countries using your iPAQ (using blogs, MSN or Skype). Briefly explain whether you did this, why or why not, and if so, whether it helped you in anyway? Remember there are no right of wrong answers—it is important for the research that you say honestly what happened and why. You have now been using an iPAQ for several months—in your opinion, is it a useful for your university studies? Would you recommend this kind of device to your friends? Why or why not? Again, there are no right of wrong answers—it is important for the research that you say honestly what you think.